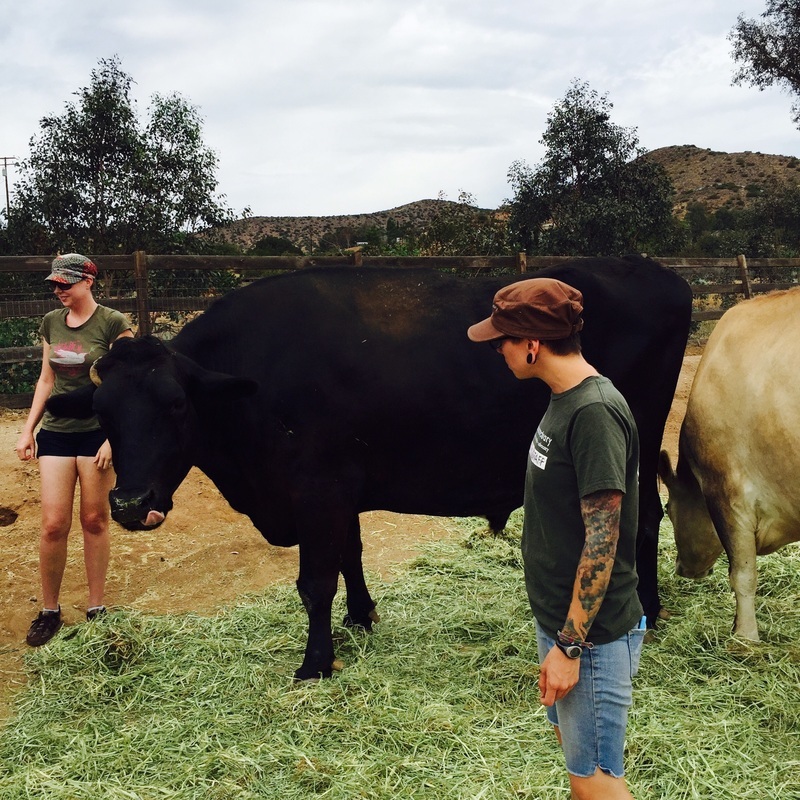 While we were in Los Angeles, we decided to visit Animal Acres -- a farm sanctuary for rescued cows, pigs, turkeys, chickens, goats, sheep, and more. After becoming a vegetarian and immersing myself in the world of animal activism, I quickly learned about Farm Sanctuary-- an organization that protects farm animals from cruelty, influences the way society views animals and promotes a vegan lifestyle. When I think about what they do, I get chills. They do amazing, difficult things-- things no one else is willing to do in a society where we cuddle our dogs and cats and kill our pigs and cows. I have included links throughout this post with further information about where animal products come from and what life is like for an animal on a factory farm. None of these links have graphic photographs-- they simply are meant to simply be informational-in case you wanted to learn more! 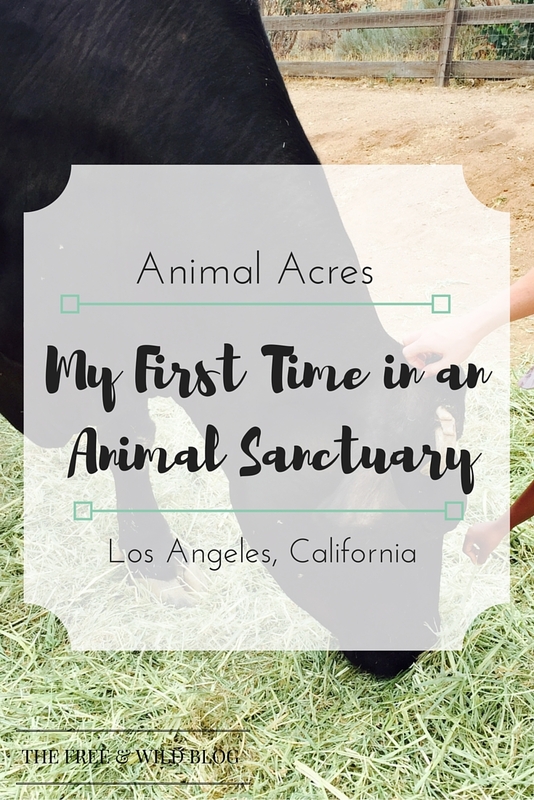 Animal Acres was about 45 minutes from where we were staying in Hollywood, and when we pulled up, I was so excited that I felt like I was going to pass out (which if you know me, you know is a completely plausible situation for me). Our tour guides were so nice and down to earth! We were in a large group and shown a short video about how Gene Baur helped found this organization. The video wasn't that graphic, but so profoundly showed what is so wrong with factory farms and how we get our meat, milk, eggs and wool. It's so sad how deceptive these companies can be, and it really upsets me how ingrained it is in our society. We don't even think twice before consuming, and it's causing a lot of damage to our earth and torture to our animals. There's so much abuse to cows, it's not even funny. One of the cows that was at the sanctuary was rescued off the side of the road where it fell off a cattle truck and the farmer just puts his insides back in and DUCT TAPED him up, and left him to die. How disgusting. I was so saddened by that, but then I realized that I used to eat hamburgers ALL. THE. TIME. How interesting it is when you realize that your food used to be a living, breathing, feeling creature. These cows were so sweet, and there's so much cruelty in the beef and dairy industries. I don't know how any one could meet these sweeties and continue to buy products that support their torture. Because of a human flu virus that was going around in LA at the time, we weren't allowed to visit the chickens or turkeys--we could only look from afar. I had NO idea how intelligent chickens are, outperforming dogs and cats in intelligence tests. I didn't know they were so socially complex or were able to think and prepare for the future. Chicken was the hardest thing for me to stop eating, because somehow our society views them as less than other animals. But these guys are awesome! We also got to meet the goats and lambs! You don't eat goat meat every day, so I really didn't realize how abused goats were. Turns out that there is a goat meat market, where the baby goats are slaughtered at just 3 to 5 months old--that's when they're the cutest! Goat milk and cheese farms artificially inseminate their goats a lot like how cows are artificially inseminated for their milk, which is painful and their babies are separated from their mamas so the milk can be used for human consumption. It's just sad. So sad. Mainly because these little goats were SO HAPPY. They wagged their tails like dogs, clearly had a bond with the staff there and even responded to their names and when asked if they wanted a treat. I have to admit the stars of the show were the pigs. Before this trip, I wasn't the biggest fan of pigs, but I also didn't feel bad cause I didn't really eat a lot of ham, bacon, pork or other pig products before. But these pigs were AMAZING. I had no idea how HUGE they were! I mean, we're talking 800+ lbs. They were so cute and sassy and man, I walked away a changed person. We could only go into the barn one at a time because these rescue piggies had endured so much trauma that they would freak out if too many humans were in there at once. It just really goes to show that animals have feelings, memories, personalities and preferences. They're absolutely incredible. I don't know how you can tour a farm sanctuary and not leave a changed person. Even if you don't stop eating meat, you have to at least think about where your food is coming from, and what it endured to get on your plate. I was already eating vegan when we showed up and I left feeling more empowered and in love with animals than ever. You can't meet so many sweet gentle faces and not feel at least a little bit changed. Going to Animal Acres felt like a little slice of Heaven. There was no pain, no suffering and lots of happy animals!